Poison Ivy (Toxicodendron radicans) is one of the most notorious and commonly found plants, but it can be difficult to identify for those who do not have much experience outdoors, as it comes in a variety of sizes and is easily confused with other plants. The most commonly seen plants are the juveniles, and the leaves on these plants are usually between 1 and 2 inches long with jagged edges. However, in mature plants the leaves can be up to 4 inches long. These are rarely seen along hiking trails and in state parks due to regular pruning. Poison Ivy is often confused with Virginia Creeper (Parthenocissus quinquefolia), the two plants have similar shaped leaves, and are can be found growing in similar conditions. Virginia creeper is a harmless plant, that will naturally outcompete poison ivy if it is not killed back. The easiest way to tell the difference between the two is in the way the leaves are grouped. 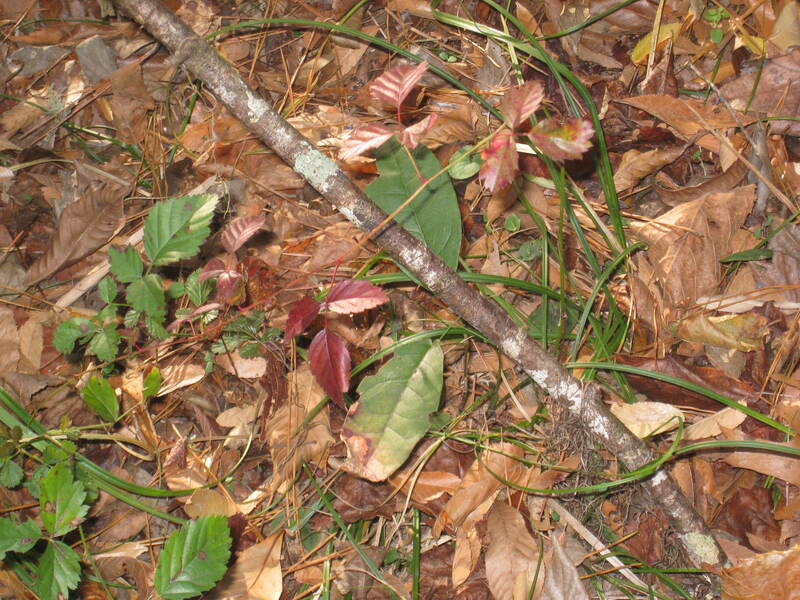 While poison ivy leaves grow in clumps of three, virginia creeper leaves grow in groups of five. A simple rhyme to remember the difference between the two is “Leaves of three, don’t touch me. Leaves of five, let it thrive.” Any further questions may be left in the comment section. Poison Ivy, immature plant. The leaves turn red and die back in the autumn.